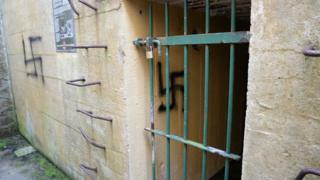 Vandals have sprayed about 40 swastikas on Nazi World War Two bunkers across Jersey. The offensive symbol was daubed on the old German fortifications using black and gold spray paint at some point over the last week, police said. The bunkers, which attract many tourists, are due to be opened for an upcoming holiday weekend. Colin Isherwood, from the Channel Islands Occupation Society (CIOS), said the attack was "the worst yet". The bunkers were built on the island during the German occupation of the Channel Islands in WW2, as part of Adolf Hitler's Atlantic Wall fortification plans. The graffiti heavily resembles similar markings made on CIOS bunkers last month, Mr Isherwood said. "We took it personally last time, but this attack seemed more widespread and targeted all war bunkers in general, not just our sites." He said volunteers from the society had been dispatched to clean their bunkers at Noirmont Point, ahead of the weekend. "They will try to remove as many of them as possible because it's an offensive symbol, especially for our German visitors", he added. Nazi symbols and salutes are illegal in several European countries, including Germany, where two Chinese tourists were recently arrested for making a Hitler salute outside the Reichstag building in Berlin. Jersey Police are investigating and say the damage could have been done any time over the last week. A spokeswoman said the remote location of the bunkers and a lack of CCTV in the area meant it would be difficult to identify offenders and are appealing for information.